A water emulsion finish formulated to protect synthetic sports floors, enhance their appearance, and make them easier to clean and maintain. 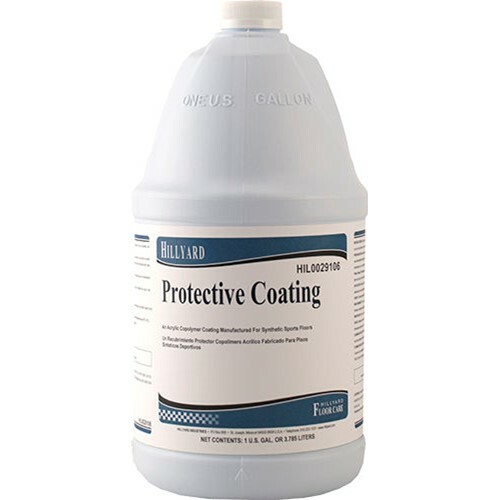 Protective Coating stands up to scuffing, scratching, rubber burns, and heel marks. And Protective Coating retains its gloss even after months of wear in the busiest of gyms. It not only helps protect the floor, but makes cleaning, dust mopping, and periodic damp mopping much easier. Rubber burns, scuffs, and dirt are held in the surface of the film where they can be easily removed. 18% solids clear acrylic copolymer for enhanced appearance and self-leveling formula for easy application. Enjoy minimum maintenance when you use this prodct on your symthetic flooring.